Note: I've been thinking of the following connections for the past week and started writing this morning. Just as I had gotten to the section on economic growth toward the end (How to Stop a Leak), I noticed that Mark Thoma had posted commentary by Brad DeLong about a New York Times review of Misbehaving, the soon-to-be-published book on behavioral economics by Richard Thaler. What follows below is not a response to Thaler's book because I haven't read it but perhaps my notes may be read as a "presponse." 72 percent of the subjects given a choice between A and B chose A, while 78 percent of those given the choice between C and D chose D -- even though the outcome of Program C was identical to that of Program A and the outcome of D was identical to B. These anomalous findings are replicated in various similar experiments. Over the years the authors persistently pointed out the implications for rational choice theory of these experimental behavioral findings. One thing that struck me right away about Kahneman and Tversky's result was its similarity to the experimental results of Booth-Sweeney and Sterman regarding perceptions of stocks and flows. It turns out that Sterman has extensively cited Kahneman and Tversky's findings in his own work, so the affinity is not coincidental. Booth-Sweeney and Sterman presented a more difficult problem to their experimental subjects but it was solvable without advanced math or any specialized scientific knowledge using the analogy of the stock/flow relationship of a bathtub. 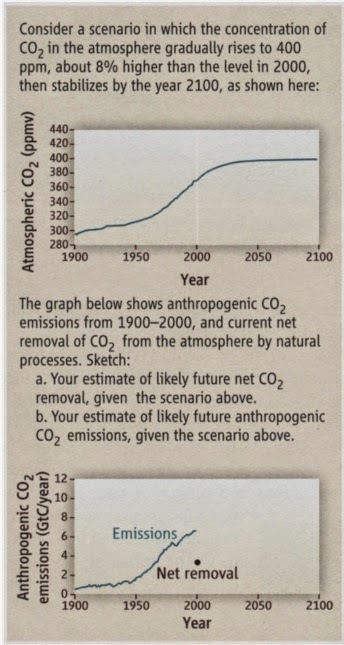 For atmospheric concentrations of CO2 to stabilize, emissions must equal net removal. The images below summarize the task and a typical subject response. 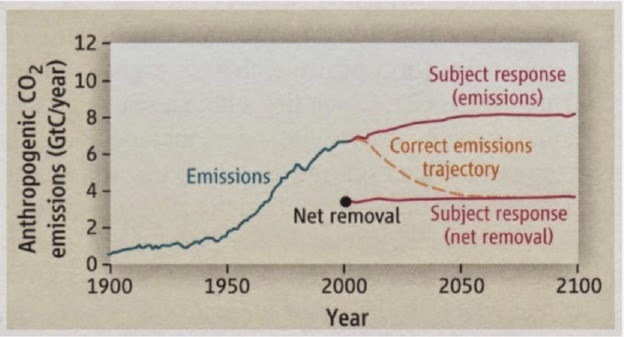 In the typical response, pictured above, future CO2 emissions are correlated with the concentration scenario rather than falling to equal net removal. 84% of the 212 graduate student participants drew similarly erroneous graphs. Many years ago I stumbled across Daniel Ellsberg's PhD dissertation, Risk Ambiguity and Decision, and his 1961 article, "Risk, Ambiguity and the Savage Axioms". Sure enough, Ellsberg's contribution to decision theory is extensively cited in Kahneman and Tversky's work. Kahneman wrote a blurb for the 2001 publication of Ellsberg's PhD dissertation, calling it "a major landmark in the history of decision research." Action I is "a bet on red," II is "a bet on black." Which do you prefer? Action III is a "bet on red or yellow"; IV is a "bet on black or yellow." Which of these do you prefer? Take your time! 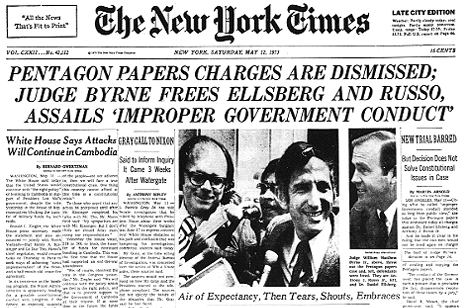 Ellsberg didn't restrict his experimental trials to graduate students. His subjects included G. Debreu, R. Schlaiffer, P. Samuelson J. Marschak, N. Dalkey, H. Raiffa and L. J. Savage. Violating the sure-thing principle when drawing coloured balls out of an urn may not seem to have quite the consequences of miscalculating the GHG emissions reduction necessary to stabilize atmospheric concentrations. Appearances can be deceiving. One of the implications Ellsberg drew from his research was that there may be a bias toward "status quo" or "present behavior" and against innovation, even to the extent of self-deceptively "ignoring some treacherous possibilities" in "familiar ongoing patterns of activity." This, of course, was one of the central findings of the "Pentagon Papers" study of the history of decision-making in the Vietnam War. As Pete Seeger sang. "we we're waist deep in the big muddy and the big fool said to push on." A further link in the chain is revealed in David Ellerman's criticism that the Kaldor-Hicks compensation criterion is based on a same yardstick fallacy. Don't let the eponymous label confound you, the K-H criterion is deeply embedded -- by administrative fiat -- in standard cost-benefit analysis. The idea behind it is that a Pareto improvement -- making some people better off without making anyone worse off -- is nigh on impossible. But the compensation criterion allows for at least a "potential" Pareto improvement. Consider a transfer of an apple from Mary to John and a transfer of $0.75 from John to Mary. Use Kaldor-Hicks to evaluate each part as a "project" with the other part as the "compensation". Using money as the numeraire and the apple transfer as the "project", we see under the assumptions that the transfer of the apple increases social wealth measured in dollars so that is the recommendation based on "efficiency", and the payment of the "compensation" of $0.75 is a matter of "equity" of concern to politician, theologians, and philosophers but not to the professional economist. Now reverse the numeraire taking apples as the numeraire and the transfer of the $0.75 as the "project". Then the transfer of the apple (= "compensation") does not change social wealth = size of the apple pie, but the transfer of the $0.75 increases the size of the social apple pie by 3/4 of an apple so it is the transfer of the $0.75 that is recommended on efficiency grounds by hard-nosed economists while the transfer of the apple is left to politicians, theologians, and the like as a matter of "equity." The citation linkage tying the numéraire illusion to the previous three anomalies is indirect, but unambiguous. Ellerman's same yardstick metaphor came from Paul Samuelson's 1974 article, "Complementarity: An Essay on The 40th Anniversary of the Hicks-Allen Revolution in Demand Theory." In a 1977 article on the "St. Petersburg Paradoxes," Samuelson didn't use the same yardstick metaphor but he did recycle a counter-argument about the concavity of the utility function that accompanied it. The dollar I stand to win in a fair gamble is worth less to me than the dollar I stand to lose. So you have to offer me better than even odds if I'm to agree to gamble and thereby maximize my expected value of (or first moment of) utility. "The dollar I win is not as worthwhile to me as the dollar I lose, and that is why I will shun a bet at 'fair' odds (and, of course, at 'unfair' odds)." This is how the Peters and Pauls of the world explain to themselves why they behave as they do, make risk-averse decisions as if to maximize in stochastic situations the expected value of a strictly concave ["utility"] function of money wealth rather than to maximize the expected value of money wealth itself. "...the determination of the value of an item must not be based on its price, but rather on the utility it yields. The price of the item is dependent only on the thing itself and is equal for everyone; the utility, however, is dependent on the particular circumstances of the person making the estimate. Thus there is no doubt that a gain of one thousand ducats is more significant to a pauper than to a rich man though both gain the same amount..."
Another way of stating the same-yardstick fallacy, would be to point out that Kaldor-Hicks the standard cost-benefit analysis assumes -- contrary to Bernoulli! -- that the marginal utility of income is a constant, This may seem subtle or even pedantic, but here we have not mere individuals but an institutionalized policy decision rule violating the rationality norm. It is worth pointing out here that the reversibility of the standard cost-benefit efficiency/equity distinction parallels the reversibility of program choice due to framing bias found by Kahneman and Tversky. What about so-called "economic growth"? One common objection to the dominant "fetish of national income statistics" has been that an increase in GDP is not the same as an improvement in national welfare. Robert Kennedy eloquently objected that the national product "counts special locks for our doors and the jails for the people who break them" but "does not include the beauty of our poetry or the strength of our marriages, the intelligence of our public debate or the integrity of our public officials." ...if a dynamic expansion of the economy were achieved, the necessary build-up could be accomplished without a decrease in the national standard of living because the required resources could be obtained by siphoning off a part of the annual increment in the gross national product. Take note of the implied equivalence between expansion of the economy, (non) decrease in national standard of living and annual increment of gross national product. The economy and standard of living are stocks; the gross national income is a flow. "Siphoning off" is also a flow; it is in fact an outflow that offsets the increment to the inflow that it presumably stimulates. Coincidentally, in a 1950 article, "Evaluation of Real National Income," Paul Samuelson had explained that including "such wasteful output as war goods" in the calculation of national income served only to indicate the potential for producing "useful things... in better times." NSC-68 contrived counting wasteful output as a direct contribution to maintaining the standard of living. There's that word, "potential" again. NSC-68 was contemporary with the Bureau of the Budget adoption of the standard cost-benefit analysis. So a potential for producing useful things was joined to a potential for compensating the losers. Whoop-de-doo. Never mind the bathtubs; here's the siphons! Ike (aka 1952 presidential candidate Dwight D. Eisenhower) was dubious about Keyserling's growth prescription. So was conservative columnist Henry Hazlitt. But their principal objection -- that it was inflationary -- was a distraction. The more serious flaw in growthmanship was its fundamental reliance on waste as the "future of prosperity." This is a theme that Kenneth Burke satirized in 1930 and then returned to 26 years later, after Business Week had featured an article extolling the virtues of the consumerist "Borrow. Spend. Buy. Waste. Want" cycle. My article like all burlesques was based on what I thought was a grossly exaggerated statement of my case. But recently  (in their May 5 and June 16 issues) Business Week published two articles that startled me, and even nonplussed me, by offering as simple gospel a line that, if I could have thought of it when I was writing my burlesque a bit more than a jubilee ago, I'd certainly have used as the perfect frisky summing-up of my thesis "Just past the midmark of the 20th Century," we read, "it looks as though all of our business forces are bent on getting every one . . ." (and here is the notable slogan) to "Borrow. Spend. Buy. Waste. Want." I would then have looked upon such a slogan as ideal material for a farce. Now presumably it is to be taken in full earnest. What might have been "material for a farce" in 1930 and "taken in full earnest" a quarter century later has by now -- another sixty year on -- become a long forgotten and taken-for-granted substrate. Ecological modernizers rhapsodize about decoupling GDP growth from greenhouse gas emissions as if that growth were something entirely unrelated to the "siphoning off" and "planned obsolescence" contrived by government officials and business leaders, respectively. Of course, merely decoupling GDP growth from GHG emissions is not enough to stabilize atmospheric concentrations. So what? Politicians and economists -- to borrow an eloquent excoriation from James Augustus St. John --"with all their incapacity, they want not the wit to perceive, that so soon as justice and a regard for the public good shall become the directing principles of government, the great business of the nation will be taken out of their hands to be confided to others more worthy." ...when the FBI could not get its act together to pursue the leakers of the Pentagon Papers, an angry president decided to created a super-secret Special Investigations Unit within the White House, using his staffers, who would oversee the activities of all the agencies who, by law, had responsibilities to deal with such leaks. This unit reported to senior presidential aide John Ehrlichman, who in turn reported to the president the failure of anyone in the executive branch to assist in uncovering the leaks they were investigating, or in taking actions they felt were needed. If necessary, the president would personally intervene to get the job done, using the full weight of his office. David Young, an attorney and former aide to Henry Kissinger, was assigned to the new unit. When David went home for Thanksgiving that Fall, his grandmother asked him what he was doing at the White House. David said, “Oh, I am helping the president find and fix leaks.” To which his grandmother responded, “Well, David, that is very nice, you've become a plumber.” When David shared this Thanksgiving story with his colleagues in the Special Investigation Unit, they cracked up, and he could not resist breaking their secrecy protocol by placing a sign on the unmarked basement door of their unit that read: “The Plumbers.” While the sign was not there for long, the name stuck. How to solder, how to stop a leak...that now is the deep design of a politician.